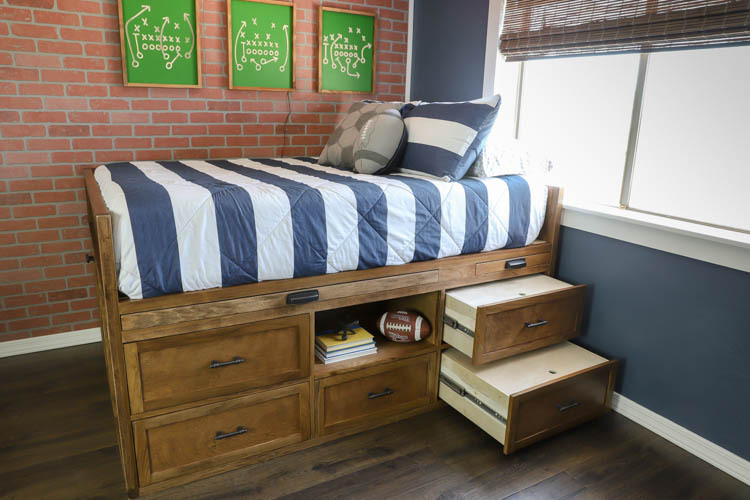 Learn how to build a DIY full size captain’s bed with tons of visible storage drawers, but also a hidden storage space plus tons of other features that any kid will love. Years ago, I was a baker and had my own cake decorating business. As my boys got older and my abilities grew, their requests for more and more elaborate cakes also grew. I mean, what kid for his 4th birthday says “mommy, I want you to make me a Gravedigger (monster truck) cake for my birthday and I want it to be made out of modeling chocolate.”??? My kids, that’s who. The same goes for the projects that I build for them. 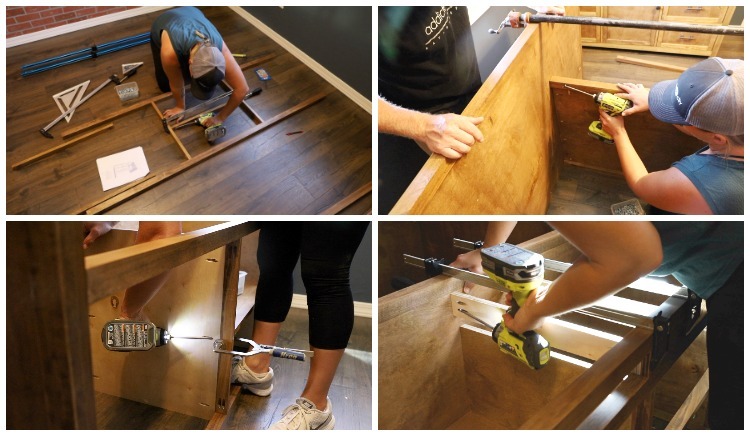 They have very strong opinions about every detail and this DIY captain’s storage bed was no exception. 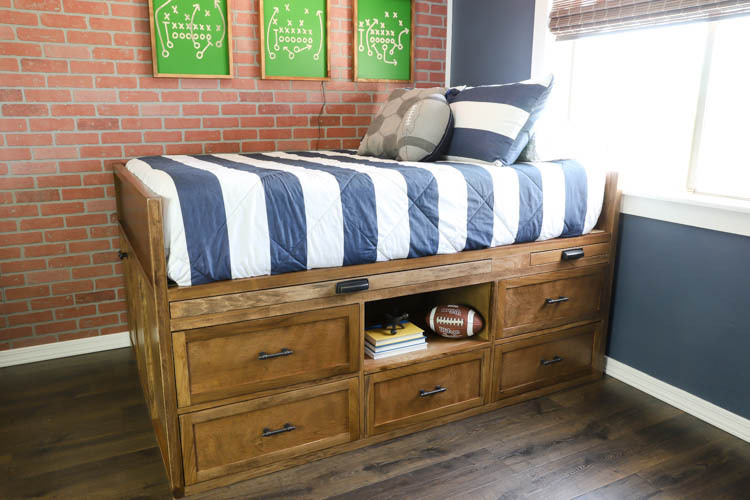 My youngest son and I spent months working through so many designs and looking for inspiration until we finally came up with this full-sized captain’s bed with storage that you can not only see, but also storage you can’t! 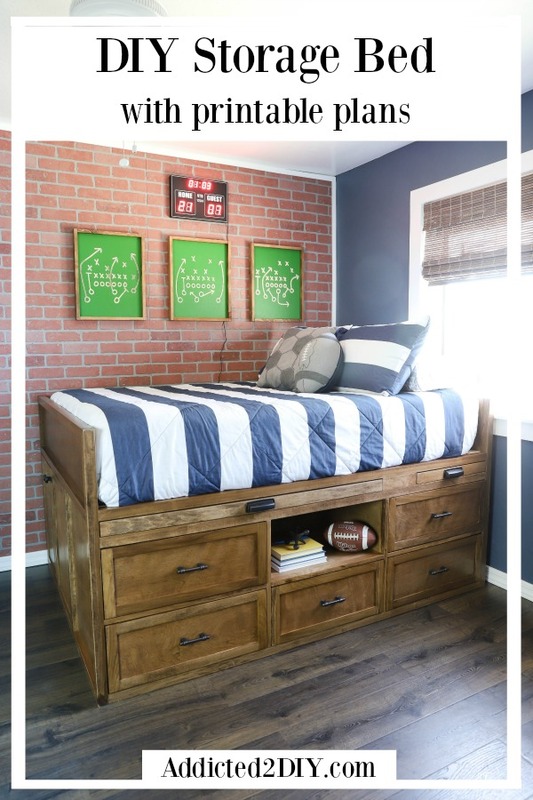 I’ve partnered with Rockler Woodworking and Hardware to bring you the printable plans, tutorial, and a YouTube video to show you how you can build your own storage bed that will have your kids thinking you’re the coolest parent ever! At least for a little while. When bedtime comes around and they have to shut off FortNite, I’m definitely NOT the cool mom. I’m going to start by saying that you shouldn’t let the length of these plans intimidate you in the slightest. I broke down all of the details of these plans to include the steps for building the pieces as well as the steps for assembly. This way there’s no guesswork on your end of where a piece should fit or what a measurement needs to be. The plans also include a full cut list and shopping list for your lumber and materials. I chose to build this bed out of poplar that I milled down into dimensional lumber (1x2s and 2x2s). You can do this, or you can simply purchase dimensional pine from Home Depot. I also used my circular saw to cut my plywood down into manageable sizes and then finished my cuts on the table saw. To build the headboard and footboard, you’ll want to drill 1 1/2″ pocket holes into the 2×2 boards and 3/4″ pocket holes into the plywood. 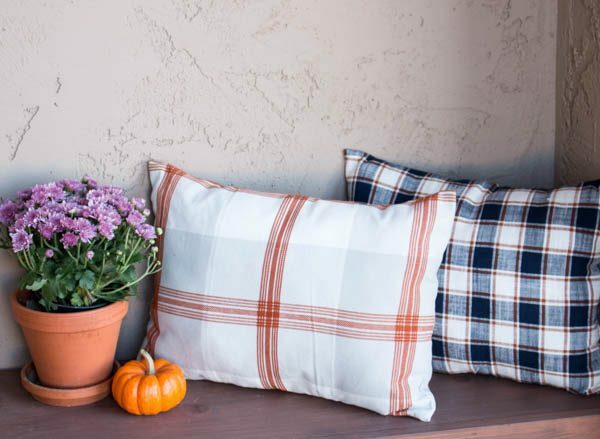 Assemble all of the pieces with wood glue and 1 1/4″ and 2 1/2″ pocket screws. For the desk and nightstand, I ripped poplar down to 2″ wide boards to make up the frames. This is necessary for the drawer slides to fit properly in their openings. You can rip down a 1×3 board if you aren’t using a lumber such as poplar. For the large plywood pieces that make up the support panels of the bed, I used my Kreg R3 pocket hole jig to drill the 3/4″ pocket holes. It’s small size makes it easy to drill the holes into large pieces such as these. 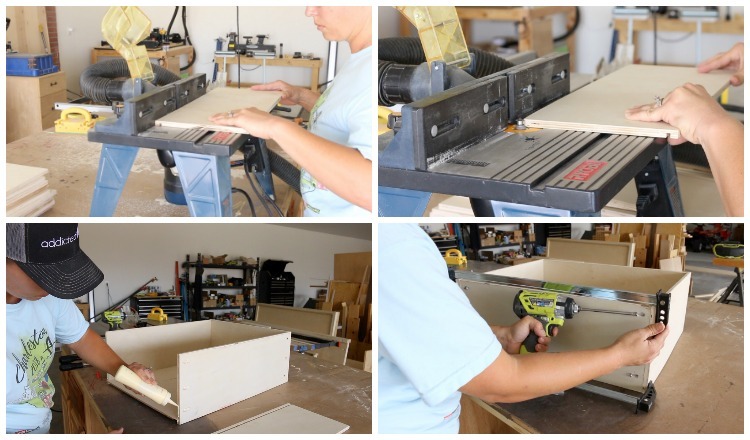 To build the drawers, I ripped 1/2″ plywood down into 8 1/2″ wide strips, then cut the pieces down to size on my miter saw. These drawers have a 1/4″ plywood bottom. I used my router to add a 1/4″ dado groove to the drawer pieces, then rounded off the top edges of the drawer pieces with a 1/8″ router bit. Another option is to sand them to round them off a bit. This helps prevent any splintering of the plywood. I inserted the plywood panels, glued up the sides, and attached all of the pieces with 1″ pocket screws. Two of the drawers are serving as steps for my son to climb up onto his bed. 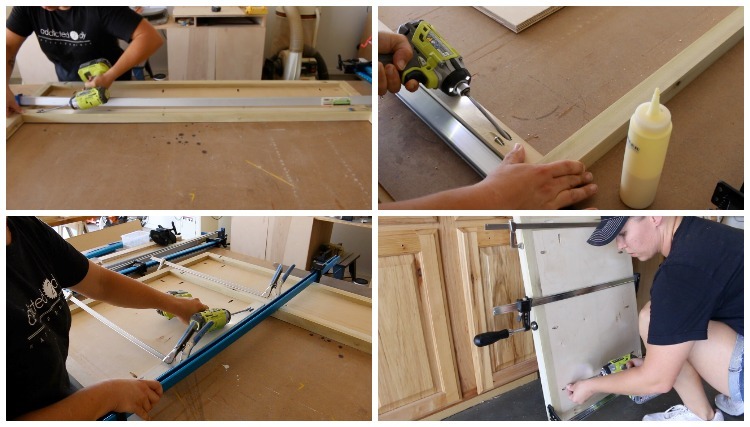 This step is totally optional and you can just build regular drawers if you like. 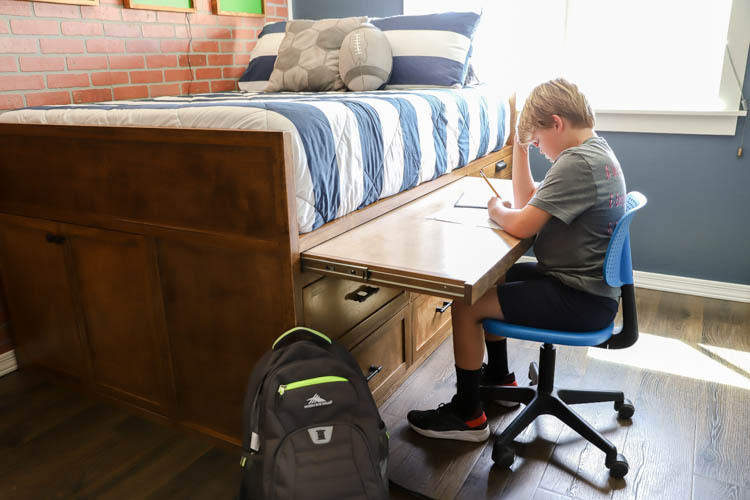 If building steps, the drawers must have 3/4″ clearance on each side to accommodate the heavy duty drawer slides, so it is not a decision that can be made after the fact. For the steps, I ripped down a board to make 3/4″ square dowels that act as cleats to hold the 1/2″ plywood tread for the step. 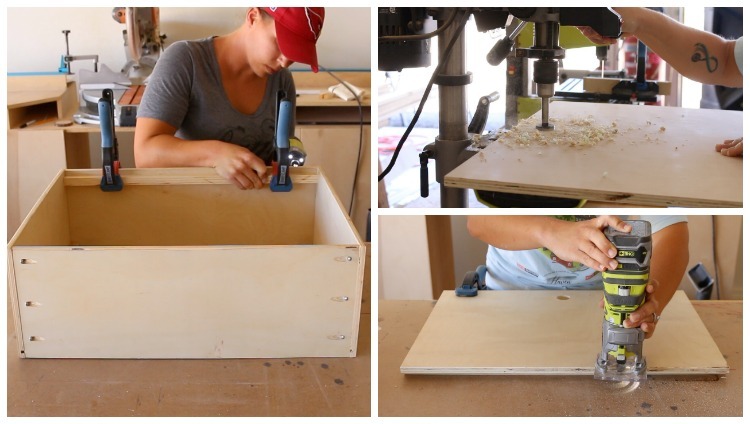 I drilled a hole in the plywood so that it was easily removable so the drawers can still be used for storage. As with the drawers, I rounded off the edges of the step to prevent splintering, then sanded it down smooth. 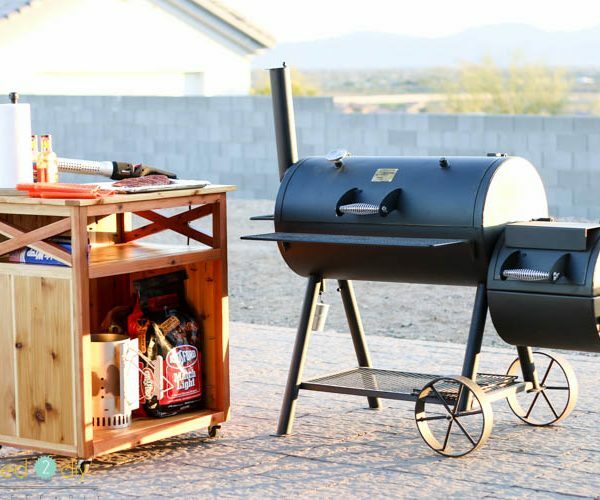 Don’t worry, the 1/2″ plywood is sturdy. I stood on the drawers and they held me, so…. To build the drawer faces and cabinet doors, I used tongue and groove joinery. You can easily just use pocket joinery; however, you will still want to add a dado groove to the rails and stiles for the plywood face. The tongue and groove router bit from Rockler was a cinch to use, though and I really loved the clean look of the finished drawers and doors. The bed must be built in parts, then fully assembled in it’s final location. This means that the staining or painting must also be done to the individual parts before final assembly. Fill any desired pocket holes with wood filler then use the stain or paint of your choosing to finish the bed. I stained this in Varathane Special Walnut, then finished it off with 3-4 coats of satin polycrylic, which I applied with my paint sprayer. 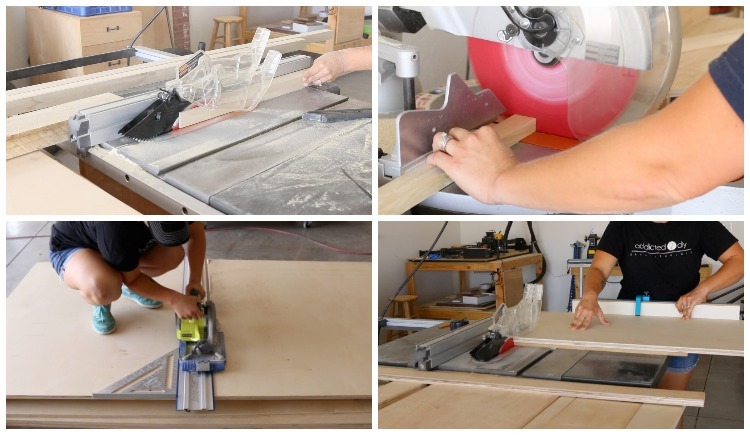 Once the bed is finished and ready for assembly, bring all of the pieces inside as well as various sizes of bar clamps (24″ to 8′). I built the face frame after finishing all of the pieces; however, it can be built prior to staining and then brought inside. Avoid gluing up the bed components when assembling unless you don’t ever plan to take it apart again. For the support panel that is attached in the middle of the bed, one side is being attached to the plywood on the headboard. Do not use 2 1/2″ pocket screws to attach the 2×2 to the plywood. The screws are too long and you’ll end up driving them straight through the plywood (don’t ask me how I know that). Instead, use 1 1/4″ pocket screws for that one end of the top 2×2 (top right photo). Once the bed is assembled, the drawers can be installed. I used 100lb, 18″ side mount drawer slides for the three “regular” drawers, as well as the desk and nightstand. I used 220lb, heavy duty drawer slides for the drawers that double as steps. Once the drawers are installed, center the drawer faces within the face frame. Even stacks of playing cards are a great way to do this. 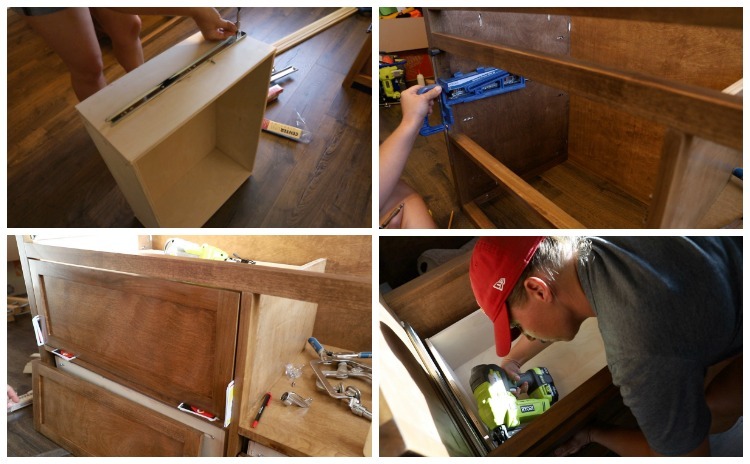 Once they are centered, reach over to the inside of the drawer and nail 1″ brad nails into the upper and lower corners of the drawer box, making sure to drive the nails into the frame of the drawer face. They will be further secured once the drawer hardware is installed. 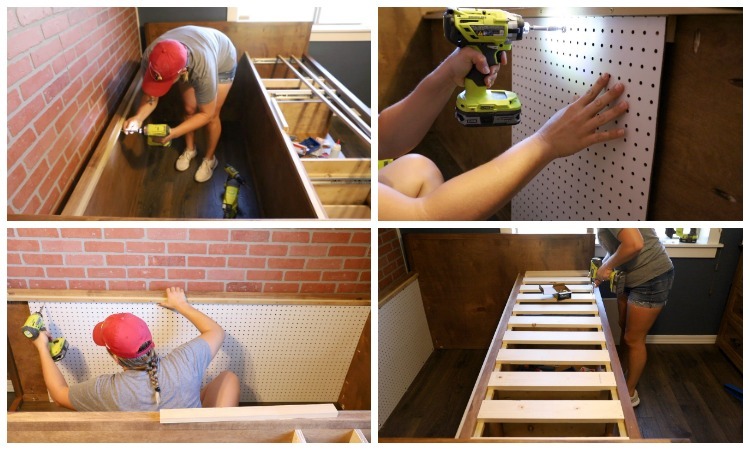 Once the drawers are installed, the mattress slats and pegboard can be installed. Attach 3/4″ square dowel cleats to the 2x2s to support the mattress slats. Make sure they are 3/4″ down from the top of the 2x2s so that the 1×4 slats are flush with the tops of the 2x2s. Attach with 2″ wood screws. If desired, install pegboard to the walls of the open compartment for hanging storage. Using a brad nailer, nail a 1×2 to the top of the plywood panel (just under the top 2x2s) to act as a spacer for the pegboard. 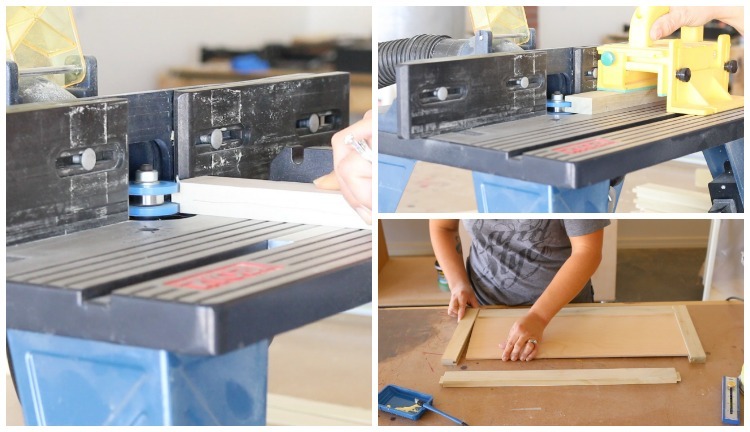 Install the pegboard with 1″ wood screws and washers. Install the mattress slats approx. 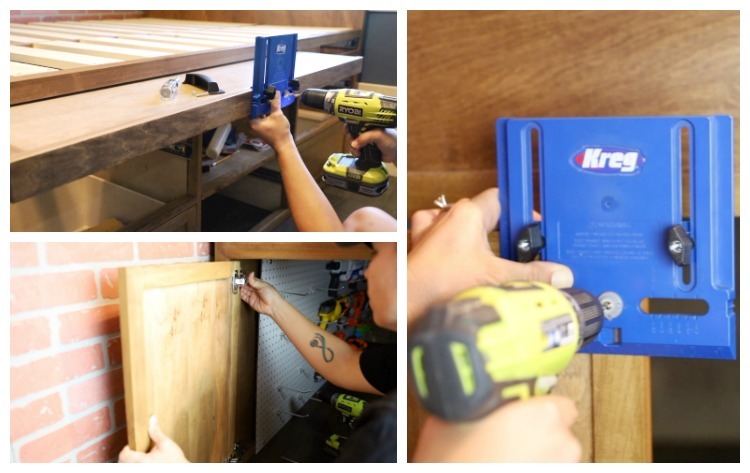 3″ apart, drill pilot holes through the slats into the cleats, then attach with 1 1/4″ wood screws. Install the door hinges on the cabinets as well as magnetic catches in the centers of the frames where the doors close. Install drawer and door hardware. I could not be happier with how this bed turned out and my son absolutely LOVES it! He can’t wait to show everyone that comes over his new storage bed, plus the hidden compartment underneath. 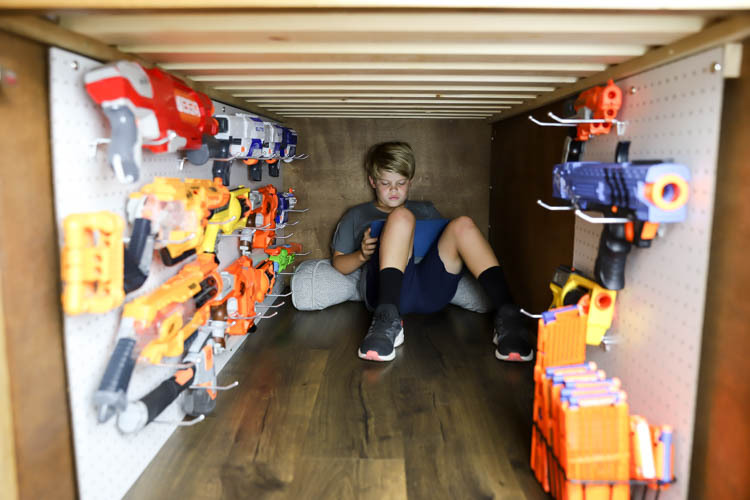 He also couldn’t wait to load up the pegboard with his Nerf gun arsenal. There’s so much storage in this bed, which means we can finally get some of the things in his room under control, though he still won’t let me touch his stuffed animal collection. 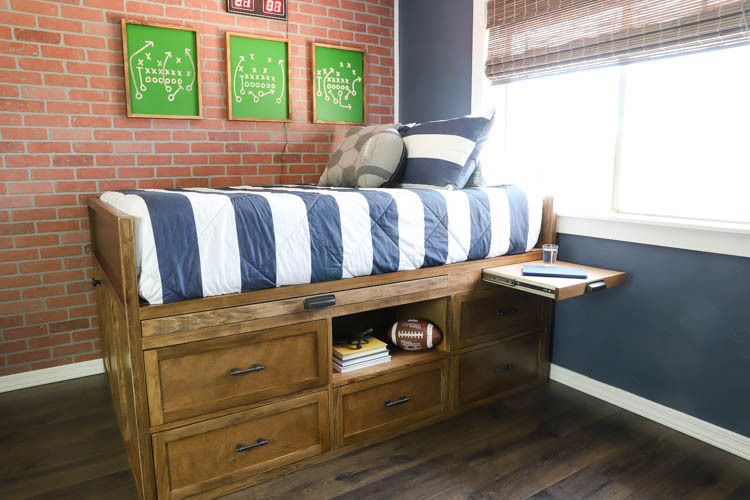 If you’d like to build this Full Size Captain’s Bed with storage, make sure you download the printable plans. If you’d like the plans to the matching dresser I built for him, you can find that here. Also, don’t forget to pin this to your project boards on Pinterest if you plan to build it later. DISCLOSURE: I was provided product and compensation for this post. All ideas and opinions are 100% my own. Fabulous job, fabulous idea. I love, love, love this post. I want this to. This is one wise bed. Excellent idea! 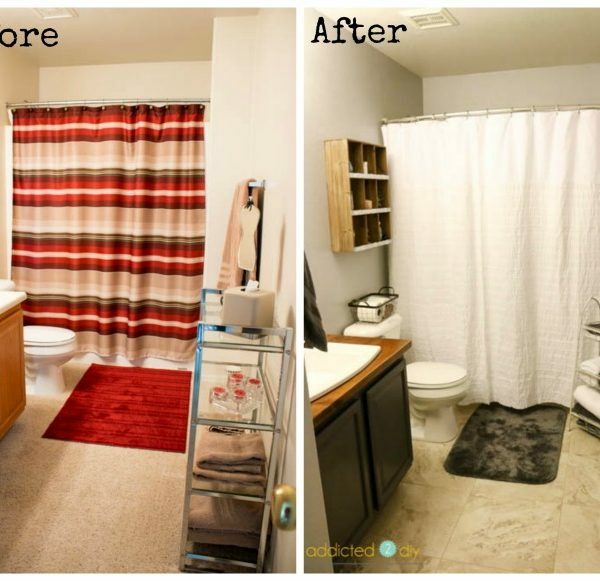 Kids would love this for sure, especially with that hidden space. Would love to have that kind of bed. Hello! We would love to build this for our son. 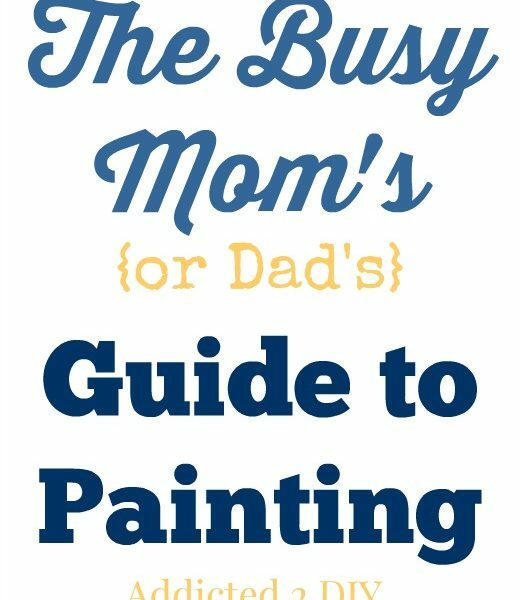 Do you happen to have a guesstimate of what the finished cost of everything would be? My best guess is around $500 or so. I added up the receipts at one point, but it was months ago. Lumber prices vary so much depending on what you use and where you live.